I’ve never been out of England. Literally. Not even Wales. I know, who hasn’t been to Wales? A whole life spent in England. Doesn’t sound particularly high-risk, does it? No carnivorous cats waiting to pounce on me on my way to Tesco. No charging wildebeest chasing me down the street of an evening. But that doesn’t mean that all of Britain’s wildlife is safe, as I was doomed to discover. This is not a mere story I am about to tell. This is a warning. A warning of the true danger of our noble shores. A year ago, myself and Amy, my dear friend and walking companion for many a year, took her dog, Alfie, for a walk in our favourite ambling haunt. Buxted Park is one of those places that could never appear on a chocolate box, because no sweet cocoa could ever match its self-aware splendour. Naturally, it was our treasure, and on that woeful day, it was taken from us. Put simply, we were accosted: by winged thugs, feathered brutes, beaked bastards. Geese: waddling ruffians who made us fear for our very lives. How naïve we were as we approached our favourite lake, stale bread in hand, looking across the rippling waters at the ducks eagerly bobbing towards us. Not half a slice had been scattered before they cut through the water like trained torpedoes. We tried to run, but too quickly they were behind us, chasing us with their devilish goose swagger, leading a baying posse of a dozen ducks. Having narrowly escaped death-by-geese, we were too petrified to return. A year later, we were finally ready. We wanted our walk back. And if I had to punch a goose in the beak to get it, then fetch me my goose-punching gauntlet. As we began our mission, we oozed determination, confidence and a little sweat. 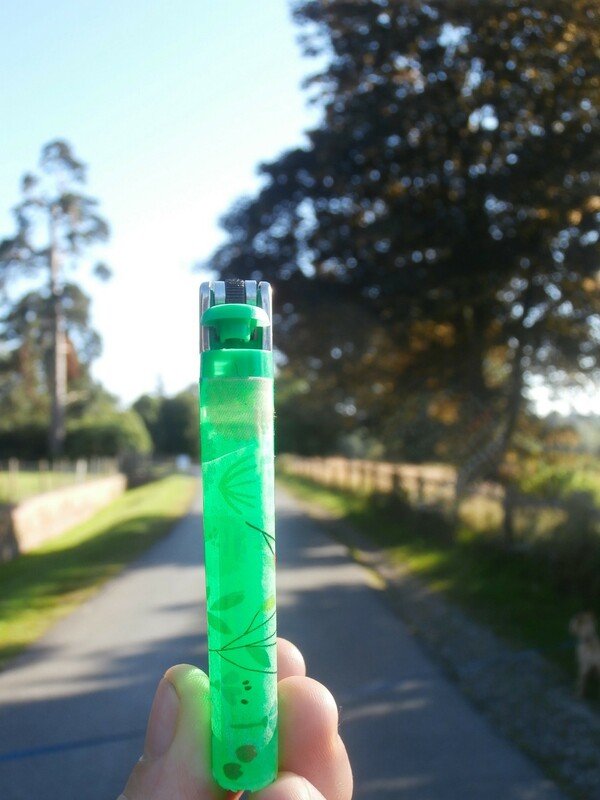 Our only means of protection were my trusty lighter – its floral pattern echoing the long grasses and tall flowers twisting across the landscape – and Alfie’s delusional sense of size. Ribbons of grass stretched up to the horizon, shades of fresh green, creamy yellow, soft moss and pale straw. At the very top sat trees, plump at the base and then thinner, like a row of upturned strawberries. They stood black against the sky, backlit by the sun, and beneath them, lakes glinted like mirrors. The paths were much lusher than they had been a year ago, grass creeping out of cracks in the dirt and lacing its way across the trail. Branches bent over our heads, the shadows they cast flickering as the wind shook their leaves. But beside me, Amy limped, her feet shredded by her ill-advised flip-flops. I clawed at my itching eyes, the packet of anti-histamines on the kitchen table mocking me in my mind’s eye. The sun glared down on our pasty skin, tainting it with a crimson glow. We were weakening. Yet we were almost there. The lake was the same. Too much so, as the memories of feathers and beaks and malicious hissing flashed before me. Amy placed a comforting hand on my shoulder, handing me a bag of oats. We scattered them into the water, the ducks nibbling on the soggy grain. It was perfect. But then I looked up. There, on the bank, where two white geese had basked a year ago, now sat a dozen or more of the web-footed louts – and soon, they were standing, heads cocked towards us. I’d like to say that I was brave, that I stood my ground, continued to feed those innocent little ducks who had done no wrong. But it was not to be. With that, I took off in a wild sprint, arms pumping frantically. My feet slid out from under me on the damp grass, but I kept my balance. Behind me, I could hear them honking, and then Amy’s voice cut across them. It was too late for her. I turned a corner and leaned against a knotted trunk, the rough bark stabbing into my back, distracting me from the image of the flying horde that was seared into my mind. I sunk to the floor, my feet pushed out in front of me, and that’s when I saw the final horror of the day. My once pink shoe, suffocating under thick mud. That’s when I broke down. This is a raw story, and not one I ever thought I would share. But people need to know the danger. The geese have claimed Amy, but no one else. Let this be a reminder to all. Yes, we only live in Britain, but the dangers of the countryside are still rife. The geese took her too soon.